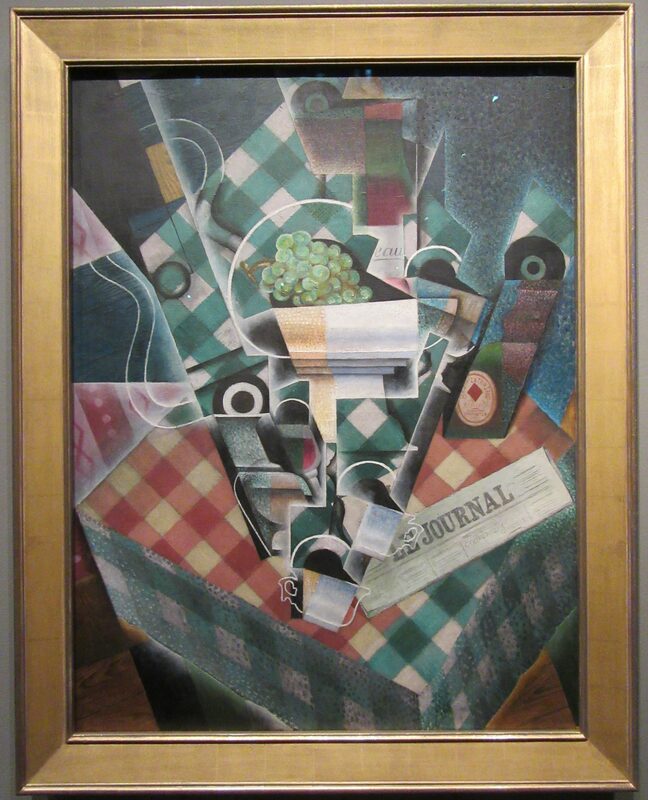 Juan Gris (1887 – 1927), a master of disguised images, presents a table brimming with coffee cups, stemmed wineglasses, a large white-footed fruit compote (see from the side and from above) containing thickly painted grapes, a bottle of red wine, a bottle of Bass extra stout ale with its distinctive red diamond logo, a newspaper, and a guitar. Yet, Still Life with Checked Tablecloth (1915) has another equally compelling identity: a Bull’s head. The coffee cup at lower center doubles as the animal’s snout, black-and-white concentric circle at left is a “bull’s eye,” the bottle of ale is an ear, and the sinuous edge of the guitar is the horn. The letters “EAU” on the wine label, which ostensibly stand for “bEAUjolais” can just as easily represent “taurEAU” (Bull).